The I-Tower LED Lamp from Koncept is a reliable LED floor lamp, getting an average of 47 out of 5 stars from 18+ reviewers. The lamp’s six ultra-bright, daylight white LEDs that give off minimal heat and use only 9 watts at full brightness. The lamp has a built-in 4-step dimming function that will take the light down for reading purposes. The adjustable joints can be placed in almost any position without tightening or loosening knobs or screws, simply move the light to where you need it and the lamp will hold to form. 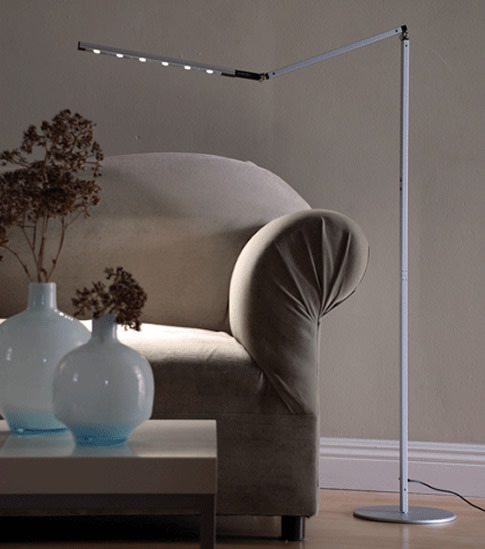 The LED arm even folds down against the lamp neck, saving space if the LEDs are not being used. The I-Tower LED floor lamps are available from Amazon for $195. This lamp was just released this year by Softech, and it has a lot going for it. The lamp incorporates 27 high-power daylight LEDs. The Color Rendering Index of the LEDs is rated at 90+ (excellent). The lamp has four distinct lighting modes and 40 brightness levels in total. The first two modes are for desk work: a reading mode with mid-range colors (4300K-5300K) that are easy on the eyes, and a study mode which has a high range color temperature (6000K-7000K). The lamp can also be switched to a relaxation mode and a sleep mode — these have softer, warm color temperatures. This lamp uses 10 watts or less of power to provide light equivalent to a 100 watt incandescent bulb. It is said to last about 40,000 hours or 20 years of normal use. A handy feature of this lamp is the “auto off timer”. The timer will turn the lamp off after one hour, saving your power if you forget to turn it off. It has a USB charging port. The Fulcrum Magnifier is an illuminated magnifying lamp has a 5-inch diameter lens has 2x magnification power with a 6x inset for fine details. This lamp gets an average rating of 4.2 of 5 from 44+ reviewers on Amazon. It has 12 glare-free LEDs and a flexible gooseneck that allows you to position the lamp exactly where you need it. It comes with an AC adapter, but may also be operated wire-free with three alkaline D batteries (see our article on The Best D-Size Rechargeable Batteries). The Fulcrum Magnifier is available at Amazon for about $75. Note from Editor: I’ve been testing this light for a few months now, and I’m pleased with it. It is lightweight, so it clips to a book easily, and the flexible neck stays in place quite well. The reviewers on Amazon agree — they gave it an average of 4.3 / 5 stars from 43+ buyers. The Fulcrum MultiFlex provides a clear, even beam of light for reading or illuminating close up tasks. It features an attachment clip, and the base can also support the 11” adjustable neck when sitting on a flat surface. Power comes from three AAa batteries, making the Fulcrum MultiFlex a good choice for travel as well as household use. The lamp is available in either silver or red. The Fulcrum MultiFlex LED Light is available at Amazon for $10.99. I can recommend two awesome LED desk lights that are only $8 and $9 apiece. One attaches to your computer’s USB port and the other sits on your desk. You can’t beat the price, but as cheap as they are – they’re really great lights too. I gave them to everyone for stocking stuffers this year and they were a big hit! Have you considered the Beam N Read Hands Free Lights from ASF Lightware Solutions? The Beam N Read LED 3 light covers 2 pages and batteries last 120 hours at full brightness which is much more efficient than many other lights. The Beam N Read LED 6 provides an extra wide light for crafts and batteries last 48 hours at full brightness, still longer than many others. They are worn around the neck and can also work with newspapers and magnazines which many clip-on can’t. No need for an object to clip them to. This form factors also enables them to be used for many other situations making them more versatile (camping, travel, emergencies, etc). The LED 6 comes with a magnifier and an attachable filter to warm the light for those who don’t like the cold-blue light of LEDs. The LED 3 comes with an attachable red filter to help avoid night blindness. I just used my small, AA battery powered hiking light. Reuse the things I already have. I don’t camp as much as I like but quite a bit of my hiking and camping gear gets used on a weekly basis. Water skins for the stroller, hiking clothes make great yard work outfits, etc. Of course, I use NiMH hybrid rechargables. I’ve never used a clip-on book light like this because they’re somewhat fussy. To be fair, this is way TOO bright for reading in bed with other lights off, so the regular version of the giglight from the same company would be better, or probably one of the things listed in the review here. But anyway, I’m thrilled with my Super Giglight for music reading. I would like to put a plug for Ikea’s new solar desk lamp. It is about the same size as the above and is LED. It has a detachable battery/solar panel. In the US it is about $20. I use it regularly and recharge it biweekly by leaving the solar panel/battery outside in the backyard. Great to see you’re reviewing LED book lamps. I’ve never used a clip-on book light like this because they’re somewhat fussy. That is, you have to mind that you don’t jostle or knock them out of alignment when turning pages or damage them when you put the book down. That makes reading at night just too cumbersome for me. What I’ve taken to is using my LED headlamp for reading at night. If you don’t mind having one strapped to your head, it can be the perfect solution. I like the Petzl Tikka XP, which gives very even light when the diffusion filter is engaged. Once it’s adjusted on your head, you don’t have to worry about coverage (the light follows where ever you look) or having to deal with something hanging off your book. I use the low setting and a red filter on mine, which make the light even less intrusive for my girlfriend when she falls asleep before I do (the clear filter is more natural, though). Can any of these lamps illuminate a whole page of a book or better yet, a whole open book? The photo of the Alliance lamp illustrates my problem with this type of lamp. Focusing on a small circle seems a bit useless to me under most circumstances.